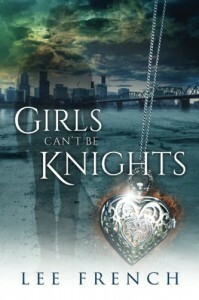 Girls Can't Be Knights is a younger urban fantasy style book. The story mixes fantasy elements in a modern day setting. Usually this is limited to older protagonists from the age 25-30. I love urban fantasy style books but the first few pages slightly put me off due to it being about a teenage girl being bullied in high school (which is one of those themes that I tend to avoid). The topic of bullying, books about kids being in the system or the death of parents are too draining emotionally. I read to be uplifted and escape into a wonderful or entertaining world. I must say that I was glad that it was different from the usual paranormal twist to a teenage love story. Focused on the struggles of the main character and her attempts to persevere no matter the obstacle faced. I originally found the main character, Claire, to be strong w/o being annoying or abrasive (except to those who treat her harshly). However, over the course of the novel I found that her character was too unbelievable and devolved in many areas. For example, no matter what was told to her or who it was said by, without any shred of evidence, she would believe and accept anything. In the first few chapters she went off w/ Justin to his house based on a feeling of him being a safe bet despite him just robbing a historical museum. She also immediately accepted the idea of knights and a secret dimension (the palace) without any proof. I thoroughly enjoyed the plot presented in the story and would have given it a higher rating if it were not for the characters. All of the characters were a bit unbelievable and portrayed in an extreme manner. If one character was nice then they would gladly adopt someone they met two days ago, and if they were mean they would abuse a teenager. Lately I have found that female characters are increasingly being better portrayed by male authors. This further showed this situation. I had so much trouble with the “development” of the Claire that it heavily took away from the novel. I received this for review through Net Galley in exchange for an honest opinion.